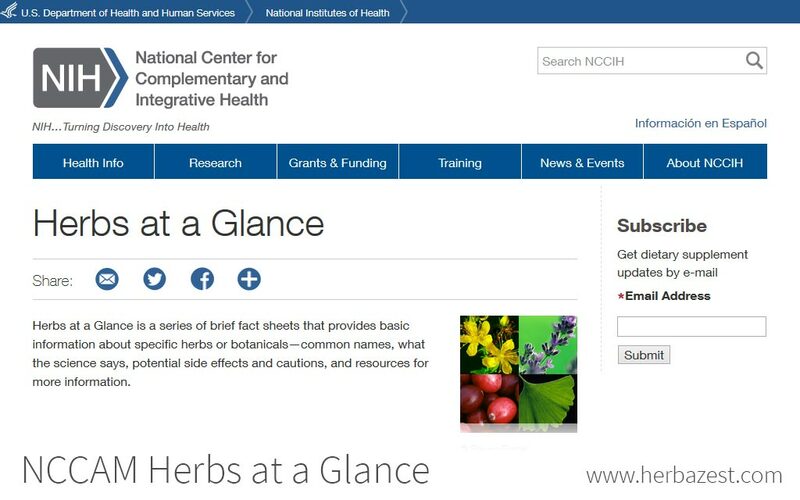 Herbs at a Glance is a series of fact sheets on popular herbs and supplements on the market in the U.S. and other parts of the world. It includes just the essential facts, such as the herb's botanical name, what the science is behind it, and safety guidelines. In that sense, it is perfect for the layperson who is more interested in the plant's medicinal standing than its whole history and ecology. The fact sheets are also available as a free eBook. The National Center for Complementary and Integrative Health, formerly the National Center for Complementary and Alternative Medicine until December 2014, is a division of the National Institutes of Health dedicated to the research of alternative and complementary health practices. Its goal is to help both medical professionals and the public make informed decisions about CAM treatments. It was established in 1998 and receives approximately $124 million in funding annually.